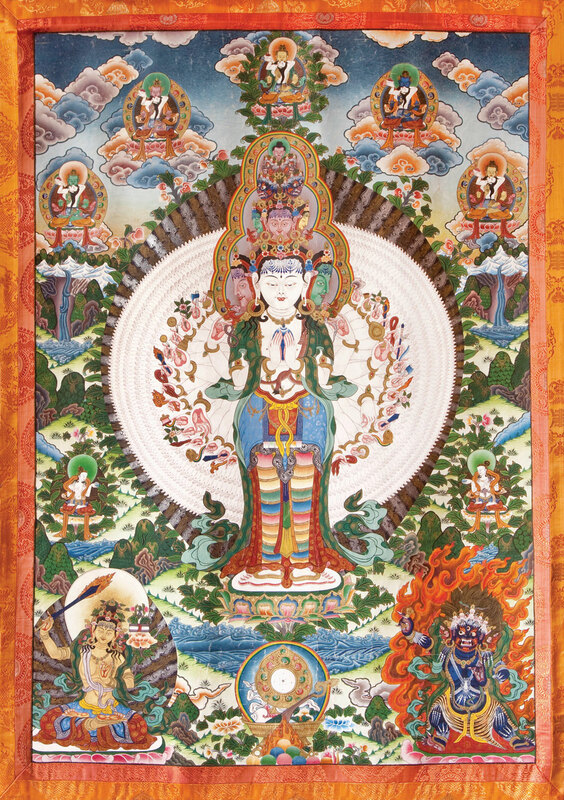 Thankgas are paintings that often depict the deities of the Tibetan Buddhist tradition. The artists who create these works of art work with very small brushes and naturally generated colors. Their training takes many years. This particular thankga is very complex – and incorporates many aspects of esoteric information in its images. Clearly, the artist who painted this one was well educated in tantric practices. 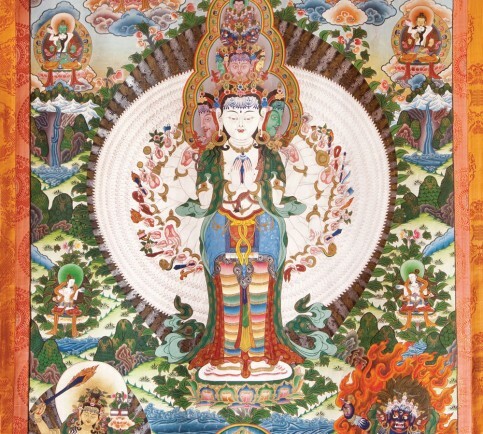 Chenrezig (Tibetan) or Avaloketishvara (Sanskrit) is the Buddha of compassion. His Holiness, the Dalai Lama is considered to be an emanation of the field of consciousness depicted in the thankga. You will receive a short explanation of the images with your purchase. Prints are available in three sizes – Small (12” x 17”), Medium (24” x 34”) and Large (36” x 54”) – and will be shipped directly to you for a nominal fee. The Sacred Stream Scholarship Fund will receive a percentage per item after printing, shipping and administrative costs. We would like to thank the unknown artist, Rachelle Ferraro and photographer Deborah Hall for all the work they have done to make this offering possible. A percentage of all sales will benefit the monks’ tour. Thank you for you support!